The exhibition Predecessors unites work completed in the past five years by Akunyili Crosby, including a number of her Predecessors works. Drawing on her history – her Nigerian upbringing and her immigration to America, where she now lives with her American husband – the artist conjures the complexity of contemporary experience while challenging the dominant narratives of Western art history. Works on display include The Twain Shall Meet, 2015, one of a number of works that incorporate an image of the table owned by the artist’s grandmother. Laden with familial and other possessions it also plays host to a range of visual cues about geographical and of changing socio-economic circumstances. A recurring motif is the kerosene lamp. Ubiquitous in rural areas of Nigeria, where electricity supplies are at best unreliable, it shares space with plastic containers used for storing, cooking and serving food. Here, ideas of home, hospitality and generosity mingle with thoughts about cultural inheritance in a broader sense. There are references to a tea culture derived from British colonialism. Christianity, another colonial import, is alluded to in two framed images of the Virgin Mary. 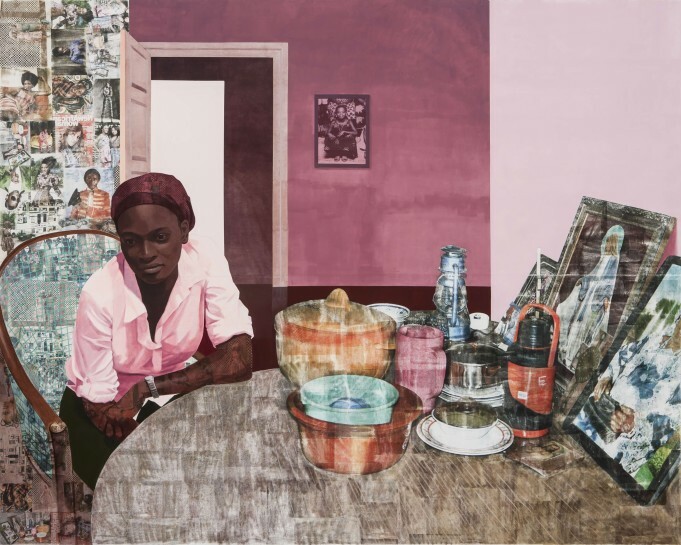 Mama, Mummy and Mamma, 2014, features the “tea things” of her grandmother (Mama), as her sister sits at the table (Mamma), and a picture of her mother as a young girl hangs on a wall (Mummy).